Some companies have adopted return on investment and investment payback policies for their internal “investments.” Common areas for these internal investments include: incremental hiring, new facilities, software development, new product lines, business expansion, outsourcing and acquiring new companies. Creating business cases for these scenarios is not easy. Many of us have spent hours trying to figure out how to create a compelling business case. I thought it useful to share my experience in this area in the event you need to create one. Both of these are generic formulas. It is important to understand the specific formula(s) that your company has adopted for internal business cases. Compliance in this area is important to obtain the necessary funding for your project. Most of the traditional business case components are financial in nature; however, there are other benefits that may be considered by a company. The criteria are primarily dependent on the company’s culture and its guidelines. The following is a list of components I considered when putting together or reviewing business cases. Revenue is the most popular component when putting together a business case. In my view it’s one of the weaker elements to rely on for your business case. Revenue increases don’t always materialize into investment gains. Reducing Cost of Goods is a good component for a solid business case, especially if there are no decreases in other factors (e.g. quality, cycle time, features, design, service costs, etc.). Increasing Gross Margin (revenue minus cost of goods) is another great component that has instant benefits providing that there are no trade-offs. One popular tactic is to increase price to gain more revenue and thus more gross margin; however, there are additional considerations that need to be made (e.g. price elasticity). This is also a good proxy for Operating Margin when that calculation cannot be made at the project level. Decreasing Operating Costs also has an immediate impact on the bottom line providing there are not trade-offs as well. Reducing operating costs for the sake of reduction is not in itself a benefit. There are many other factors that should be reviewed when considering this component. Operating Margin (Gross Margin minus Operating Costs) is also referred to as Operating Income, “The Bottom Line,” and Net Margin. There are further calculations that take into consideration other factors such as interest, taxes, depreciation, amortization and time value of money, but we will leave those out for the sake of simplicity. Employee Satisfaction and Employee Retention are components that are often left out of business cases and can translate into improved results. Like Customer Experience they are hard to measure and are also somewhat subjective. The first step in creating a business case is to Articulate the Need. This should address the problem and/or opportunity that is at the heart of the request. Defining a Vision for the recommendation is essential to convey how the need is being addressed and sets up the foundation for the business case. Once the need and vision have been defined then its time to create the Value Proposition. This proposition defines the value that the investment will bring, and it helps ground the conversation on the solution versus just the numbers. For example: “By creating a self-support system online, we can reduce call volumes to customer service by X%, reduce our call center outsourcing costs by Y% and improve the customer’s experience by X bps saving the company $X per year.” This helps get everyone’s focus on the benefits of the recommendation and the value it brings to the company. The Proof Points for the business case must support the value proposition and the underlying information must be founded in facts. Sometimes there is no history to use as the basis for an increase or a decrease in a particular metric, and other methodologies must be employed. These methodologies might include comparing the business case details to similar historical situations. In some cases, you might have the luxury to do some testing to see what the benefits are. Sometimes you can leverage industry or competitive information. There also might be times when there is nothing concrete to base your business case on and some very raw assumptions might need to be made. In this case, be very conservative to create a logical/reasonable business case and win over your approver(s). Once the proof points have been gathered, use the Lower End of the Range to put together your business case. I always like to under-commit and over-deliver. The trick is to come up with a reasonable and credible business case. It is also a good idea to put together Pro’s & Con’s for your business case to further articulate the benefits and to also to call out any risks that might exist. This will show that you have thought through both the positive and negative aspects of your recommendation. Make sure to implement a Business Case Accuracy Feedback Loop so you can compare your actual results to what you recommended. This will help fine tune and give more credibility to future business cases. It is important to have Finance Department Sign-off on any business case assumptions and financial benefits. It adds credibility to the business case, and it will align a much-needed ally when pitching the information to the approver(s). A business case is rarely useful if the results are not “Baked-In” to the financial plan. If the business case calls for higher revenue and lower operating expenses, then those increases and savings must be included in the plan. If these numbers are affecting other departments then it is imperative that they acknowledge the benefits and agree to include them in their plan. This will hold the right people accountable for the results, and the business case will have a higher chance of achieving its desired outcome. Sometimes there are unintended consequences to the business case and most of these are due to Unforeseen Situations. I once decided to centralize a regional sales function in one country and did not understand that there were cultural and language issues that prevented the benefits from materializing. The sales close rate was about half of what it was previously, and we had to spend twice the marketing budget and hire more people to make up for it. This wiped out all the benefit of centralizing the function and created issues for our customers and employees. Many business cases have Dependencies on other areas. It is imperative that these dependencies be called out and that the owners of the dependent areas be brought into the fold and that they buy off on the benefits and incremental costs. Failure to do so will compromise the results of the business case. There are times when a business case is done for a project without considering the impact on Adjacent Projects or Products. I have seen business cases that were designed to boost or promote a certain product or customer segment without considering the side effects it might have on adjacent products or segments. One thing I find important is to understand the available funds, how they will be allocated, how the Decision Process will unfold, and what is needed to make sure the project stacks high enough for consideration. Sometimes the decision criteria are based on a current initiative (e.g. more revenue) or it might be based on the highest ROI. In some cases, the budget is dedicated to a specific line of business, a region, a specific product set or a key function (e.g. IT). Understanding the ground rules is important and helps to make sure the project aligns well with the criteria that will help get the project funded. Regardless of the methodology, it is important to understand how you are going to create value for the company. This recommendation might seem a little unorthodox, but I find that watching Shark Tank episodes on YouTube is a great way to see how “investors” think when they consider investment opportunities. Read my recommendations on Delivering Effective Presentations once you are ready to present your business case. The framework I have outlined in that article applies to this process as well. 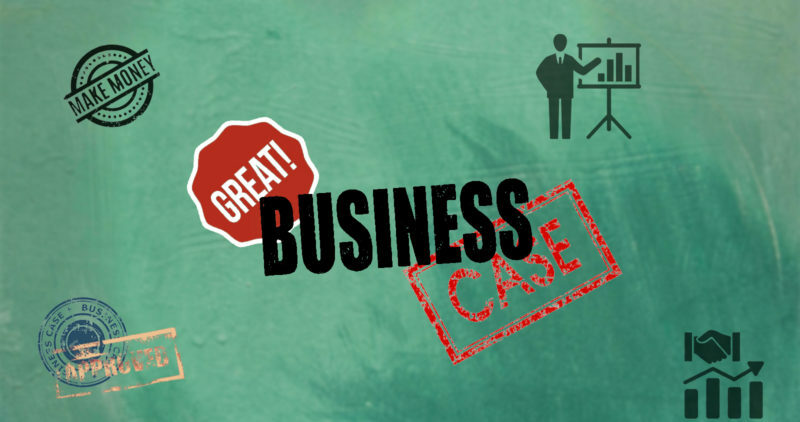 Understanding the basics of a business case, being familiar with the components, having a good framework and understanding the ground rules will help improve your business case and it will improve the odds of getting your project funded. Have a great day, and don’t forget to make a positive impression today and every day! © 2018 T. Kahler Coaching, LLC, All Rights Reserved. © 2019 T. Kahler Coaching, LLC, All Rights Reserved.